Someday, someone is going set up a camera in my place. At least I hope so. Because over the last three years, I can safely say that the craziest things have happened to me. 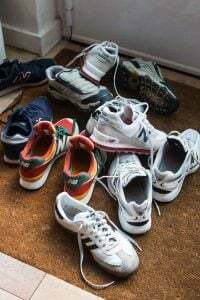 I’ve often toyed with writing a book about it, but no one would believe me, and it would quickly get tossed into the fiction bin, dismissed as folly. Oddly, I’ve been finding comfort in the easy-listening music of James Taylor, who seems to understand what I am going through, as he gently reassures me that, indeed, all is okay – because I’ve got a friend. Recently, I found out that I’ll be doing an event with Joe Yonan, a really super fellow. And if he didn’t live three thousand miles away, I’d be able to rely on his cheery presence more often than I do (and more often than Mr. Taylor), to make me feel better. Fortunately, I have his latest book in my kitchen, which is the next best thing. Eat Your Vegetables is a compendium of vegetarian-based recipes for solo cooks and diners. While the recipes entice (I’ll get to those in a minute), I love the way he has scattered lots of quick tips and pointers for being more efficient in the kitchen throughout the book. There’s a whole chapter called Storing and Using Up Extra Ingredients with spot-on tips about what to do with a leftover half can of beans, a trick for preserving a sliced avocado so it doesn’t brown, and how to deal with the bane of every solo cook: leftover celery. And his six-page essay about relying on your senses should be required reading for any cook who needs prodding to trust her instincts. Joe put into words exactly how I feel about cooking and baking. I’m eager to try his Quick Pot of Brown Rice (page 177), which has become my nemesis since I picked up a bag at the Asian store and brought it home, drawing scowls from my Frenchman. Determined to prove him wrong, I bookmarked a fail-proof recipe floating around online. However, when I made it, it confirmed my Frenchman’s fears about le riz complèt (brown rice). But I trust Joe, so his version is next on my docket. What fixated me most was Joe’s recipe for Marinated and Baked Tofu, which promised tofu that was crisp on the outside, and soft on the inside. Which just happens to be the way I like it. Not to get on a soapbox, but who doesn’t like crispy food? Even if tofu isn’t on your list of likes, this recipe will put it there. I pan-fry tofu because I’ve found oven-baking yields uneven results. But I just happened to have a block of firm tofu waiting to be used and gathered all the ingredients from my pantry to give it a go. Some may sound obscure to you, but never fear, Joe is there to give you alternatives that’ll work just as well. To be honest, I was a little apprehensive that the tofu wouldn’t be crispy, since the marinade has so much liquid. 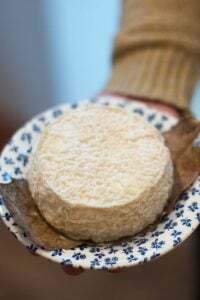 But call me convinced (which is more than I can say about Romain; I’ve hidden that bag of brown rice to spring on him on a future date…), because each little nugget came out with a marvelously well-browned, crisp coating. 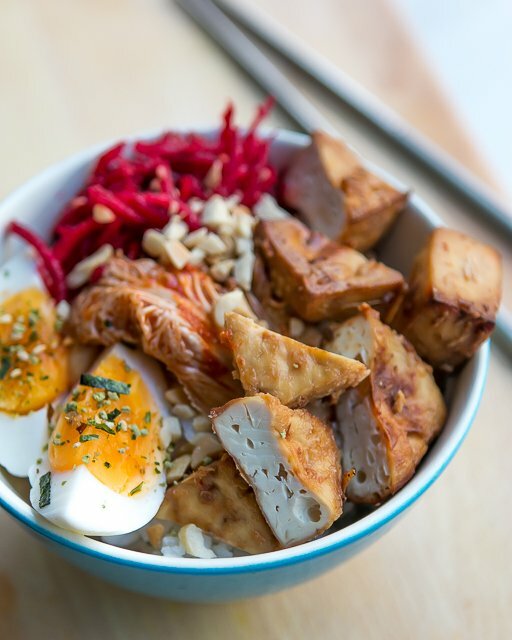 I used the tofu to make a Korean-style meal-in-a-bowl, piling up kimchi, hard-cooked eggs with furikake (a seaweed-based Japanese seasoning that should be a required in every pantry), shredded beets and carrots tossed in rice vinegar, and roasted peanuts over the top. I served it over white rice. But since the crispy baked tofu was such a success, I’m counting on Joe to get me over my next hurdle, that riz complèt. Adapted from Eat Your Vegetables by Joe YonanI’ve marinated tofu before, but it seemed unusual to press the water out of the tofu before adding the marinade which, interestingly, also has water added. But it was explained in the book that pressing the tofu to extract the water, and wiping it dry, helps the tofu absorb the marinade.I made half the recipe that is in the book (which are the quantities that I give here), so you can certainly double it. The only thing I did differently was to dial up the chili paste, because I don’t mind a little extra zing. 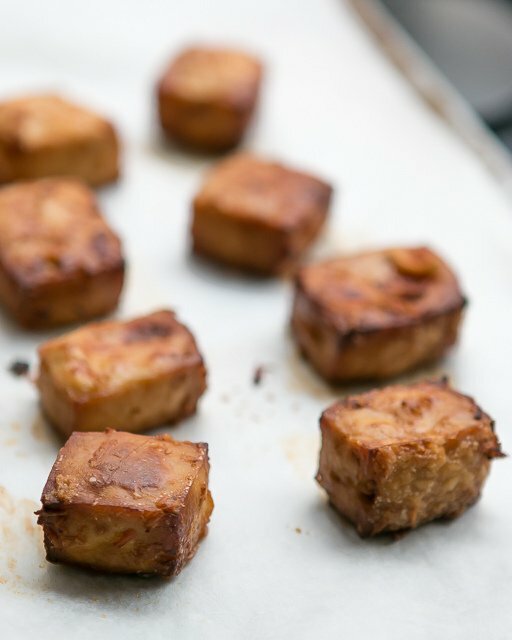 You could use more, and I may do so the next time I make it.Joe recommends making a big batch of these tofu cubes and keeping them in the refrigerator for other uses, scattering them in a stir-fry, tossing them with ramen noodles, or tucking them into an Indonesian wrap. Mine got eaten almost immediately. 1. Drain the tofu, wrap it in a paper towel, then place it on a plate. 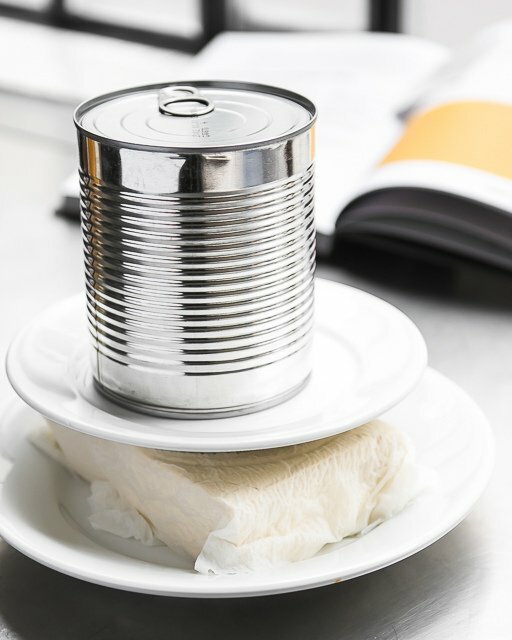 Put another plate on top of the tofu and place a heavy can of beans or tomatoes on top of it. Let stand 30 minutes. 2. 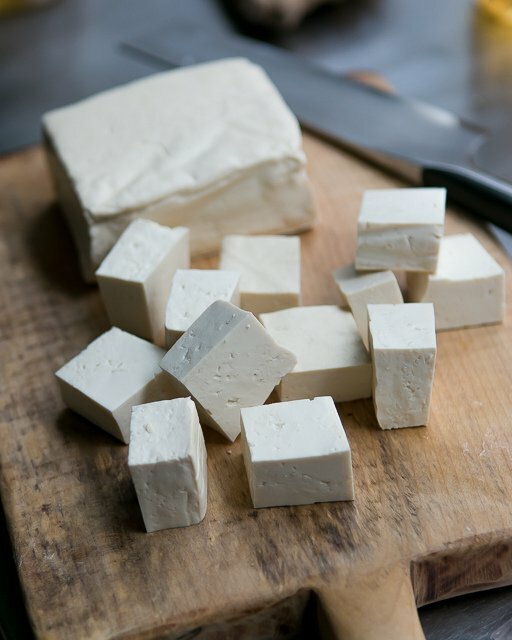 Unwrap the tofu, wipe it dry, and cut it into 1-inch (3cm) cubes. 3. In a large, zip-top freezer bag, mix the sesame oil, soy sauce, rice wine, rice vinegar, garlic, ginger, water, Sriracha, and salt, if using. (See Note at end of recipe.) Add the tofu and toss the cubes in the marinade. Lay the bag on a plate and refrigerate for a minimum of 2 hours, or up to 8 hours, turning the bag a few times while marinating. 5. Line a baking sheet with parchment paper. 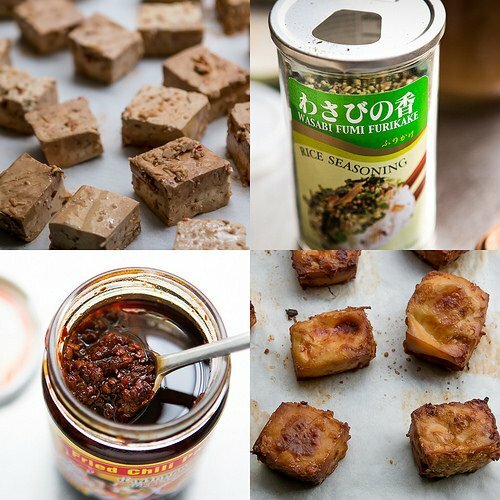 Drain the tofu (the marinade can be reserved, refrigerated, and used for a dipping sauce or dressing for another dish), then put the tofu cubes in a large bowl. Using a mesh sieve or strainer, sift the corn starch over the tofu pieces, working in batches as you sprinkle them with the corn starch. 6. Transfer the tofu cubes to the prepared baking sheet and bake, turning the cubes several times during baking, until they are crisp and browned, about 45 minutes. Serving and storage: The tofu can be served warm or at room temperature. Leftover tofu can be stored in the refrigerator for three to four days. Note: I didn’t add the salt because I figured the soy sauce would provide enough for my taste, which it did. However the original recipe and some readers did like the salt added. So you can add it if you’d like. I cook with tofu a lot but I need to step out of the medium-soft, beef-with-tofu, realm and get a bit more adventurous. I have firm tofu in the fridge I plan to cook tonight so I’m taking baby steps. Your crisp baked tofu may be next. Hi David- sounds fantastic…I live in Geneva, Switzerland but often head to the LeClerc or Carrefour in France for groceries. Is there a firm tofu brand generally available in either that you recommend? 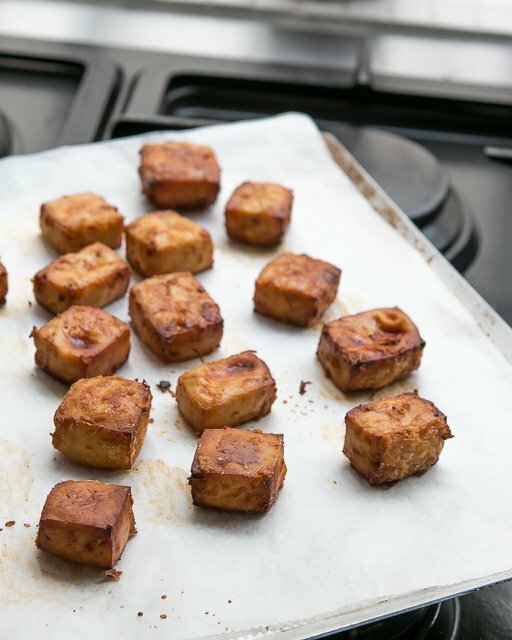 My adventures cooking with tofu- and yes, I am a total novice, have not gone well when I use Swiss tofu. Also, do I dare ask, can use Thai red curry in place of Sriracha? Many thanks! I’ve not been to Geneva so don’t know any specific brands, but I just buy tofu at the Asian market, trying to find a brand that looks the best. (We don’t have a huge selection in Paris, but most Asian stores carry a few brands to choose from.) Thai red curry would be great – and as mentioned, feel free to dial it up! Thanks David! I will try an Asian market. This looks lovely. Even better to use a clean (!) non-terry-cloth (!) tea towel for draining tofu — it pulls out way more moisture than a paper towel! Hi David! The tofu looks delish…I can envision it sprinkled in salads…yum! I love fried tofu, especially when it is done to perfection, crisp crunch into feather softness. It is so versatile! My oldest daughter introduced it to me a few years ago, before then, I only stared at the packages and made comments similar to, “Ugh, I don’t think so.” … “What is that AND why is it?” Yes. I was a snobby, ignorant biatch. Once I over came my apprehension and fear I discovered an item with endless possibilities. Now, as for James Taylor, let me tell you about our time, “Up on the roof.” Oh. My. God! I was fortunate enough to see him in a small venue thirty or so years back. Simply an amazing gentleman. His voice really is as beautiful even without accompaniment. Most of the double-digit arrondissements are less-expensive than the single digit ones, such as the 6th or 7th. 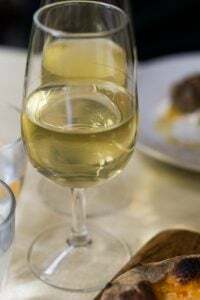 I’m not sure what your budget is, but here are some Paris hotel suggestions in a few price categories, as well as more links to check at the end of that post. Running out to the local asian market, where we actually have two ladies that make homemade tofu, now that I have a recipe. P.S. Do not see Denver on your list of stops for book signing, but as an incentive, James Taylor will be playing at Red Rocks this summer. Been an interesting programme on our food channel – an Australian chef with Vietnamese roots travelling around France (he has French relatives!) and comparing food. So much that he is used to originated in France – pho = pot au feu – due to colonisation. Vietnamese baguettes etc. Its been interesting when he has tried to cook with spices/chilli – not always appreciated by the French. Spices, especially hot ones, can be a challenge. But I don’t dial them down too much for local tastes because the spices and chiles are part of the dish. This crispy baked tofu sounds and looks so tempting, I can’t wait to make it myself. Merci beaucoup for the recipe! 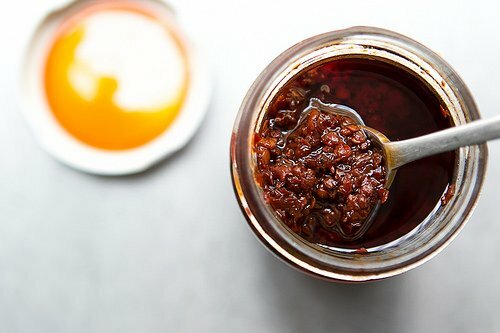 Have you ever tried to make your own Tamari sauce? I’d be grateful if you had a recipe to share. What a great way to cook tofu. Frying always soaks up so much oil and adds calories — ugh… And thanks for the heads up on the vegetable cookbook. I’m trying to learn new ways to cook vegetables and they’re becoming my favorite food. When I was growing up we ate green beans, broccoli, creamed cauliflower, sweet buttered carrots — that’s about it — good but I got tired of them. I had a wonderful pork and rice noodle soup in Denver recently — best soup in the world! ….haven’t listened to JT in years but should start again — his songs are still in my head! 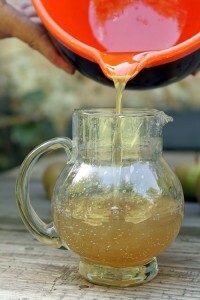 Nice to see someone using the same vinegar I use! I love this. One tip for pan-frying tofu that I have adopted is to sprinkle the cut up tofu blocks (firm or extra firm) with a bit of salt to draw the water out (similar to prepping eggplant). Then let sit for about 5-10 minutes and dab the water away; flip the tofu, repeat. It always results in a crispy finish for pan fried or broiled tofu. The only cooking method that has ever worked for me for short grain brown rice is an oven method from Cook’s Illustrated, in a foil-covered baking dish. Found it repeated on the web here http://community.cookinglight.com/showthread.php?84814-Cook-s-Illustrated-Brown-Rice-Oven-Method-(02-06). Thanks for sharing! I’ve been looking for some new tofu recipes to add to the mix. I’ll be checking out this cookbook as well. Sounds like it’d come in handy. Tofu. Perhaps there’s hope yet. think I’ll give yours a try. It will be a big step for me. Wow! Just discovered that Berkeley Public Library has Joe’s book, as well as two of his other cookbooks. I can hardly wait to try out some of the recipes as I’m eating very little meat and more vegetarian. Thanks for this fine article. I find cooking for one really difficult and so even though I don’t do it very often, I think I need this book. I live with a pair of tofu AND riz complet deniers – and I LOVE the sound of this tofu – so I shall test it out on them, safe in the knowledge that even if they don’t like it, I can make it for myself! This is one of the few, if not the only, recipe for baked tofu I have seen that does not use sugar. 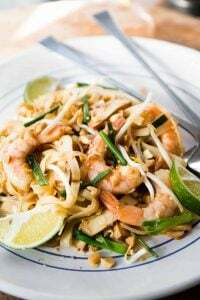 Asian foods often tend to be sweetened, a taste I don’t care for in savory dishes, so this recipe will be one to try for sure. I really like the photo of your Korean dish — it is inspiring. Thank you, David. Hi David. Huge fan of your food! I never thought I’d say this but I cannot wait to get to the closet Asian Market and buy some tofu. 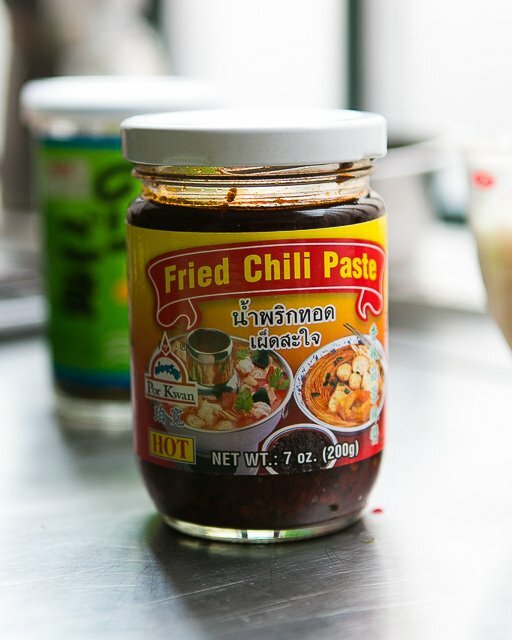 I have never had good luck cooking it- thanks for water tip, would have never thought to do that.. Love the chili paste and spice. Thanks for recipe! If Joe’s brown rice recipe falls short this technique from Saveur was one of the best finds. I’m not vegetarian but I eat more tofu than meat in any given week. When pressed for time, I usually just fry it and for flavour, add chopped onions, some tamari and lemon juice and lots of freshly ground black pepper. Anyway, I’m always happy to see a new tofu recipe. I have all the ingredients luckily, and immediately upon reading this post, made a batch. It’s now sitting in the fridge to marinate overnight, and I’m already looking forward to lunch. I even have kimchi and furikake, and you guessed it – brown rice (also red and black) so it’s going to be a DL-inspired fare. Yes, I’ve taken to calling you DL! Greetings from Holland! David: We lived in Taipei for several years and learned to cube the tofu BEFORE pressing/weighting to remove liquids. Oh, wow! This is the first recipe I’ve seen for really crispy tofu that bakes it rather than frying it. Can’t wait to try it! My fruit and vege shop has an entire chiller full of tofu so I look forward to plucking a likiely candidate from it – it will be good to widen my horizons from silken tofu in a box. Thanks for the recipe David. I made this tonight and am wondering if the tofu amount should be halved like the other ingredients? The proportion of marinade to 2 lbs of tofu seemed too little. There was not quite enough to cover and penetrate the tofu and I had to add salt when these came out of the oven. 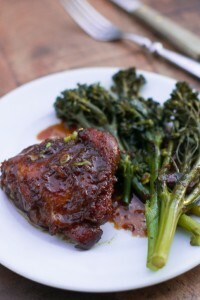 I served it with rice, broccoli and a peanut/ginger/soy sauce and it was great. I will experiment with the proportions on my next try. Thanks for your blog! Hope to see you on your book tour! Looks great, but wondering what would be a good substitute for corn starch (for someone who can’t eat corn). Thanks! lizzie pb: I haven’t tried it but usually potato starch is a good swap out for corn starch in recipes. You can often find it in the kosher section of well-stocked supermarkets and other stores. If you do try it, let me know how it works out. 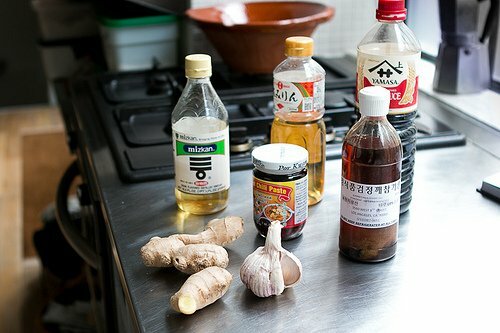 Inga: Yipes, the marinade should be for 1-pound of tofu. Sorry about the oversight (and to any others, as I mentioned, it’s been a bit crazy around here…) To make it up to you and anyone else who couldn’t wait to make it right away (…and why not? That’s what I did..) I’m going to make a donation to the UN World Food Programme to make up for it. re: salt. Joe adds salt to his, but I didn’t think it needed it. So it can be added, or not. Thanks, David. I will try it and let you know. LUV this tip about pressing the tofu. Makes perfect sense. Bon appétit! Fenland celery has its own AOC. You can tell when the season starts – around November – when you see piles of it outside every market stall. Take gloves if you want to sort through, it comes with half a fen on each head. Its stronger flavour works well pickled. 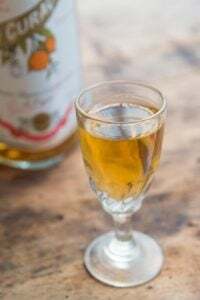 I use my normal pickling liquor. You, no doubt, would be far more creative. One tip, leave the chilli whole, then you can take it out when everything is spicy enough. I’ve never been able to get my tofu crispy enough so I’m looking forward to trying this. Comfort food/soul foods are odd terms but I do have dishes that cheer me up. 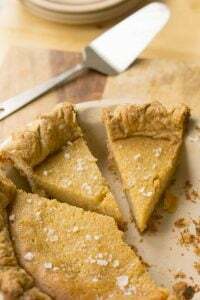 It’s more likely to be the sweet flaky pastry variety or oozing melted cheese, works every time! Asian food has that calming effect on me, as well. I’m 10 minutes from Little Saigon here in the O.C.. (So. Cal). Love bo bun and pho. I have Vietnamese in the family since the war. I love the french influence of the Vietnamese cuisine. Beautiful marriage of flavors. Have you enjoyed a invigorating Cafe Su Da yet? Perfect Saturday morning beverage to start a busy day at markets. We recently became plant based. I have been wanting to make a Crispy tofu as I do stir fry often. Thanks! Crispy tofu is the best way to eat it, love that does recipe does not involve a ton of oil to get the aforementioned crispiness. And love that chapter in the book of how to use leftover ingredients. You will have to share the secret to keeping leftover avocado from browning….! Welcome to the Land of the Enlightened – JT fans – of which I’ve been a member for over 40 years. As for the tofu, you’re on your own there. You’ve got a friend but she’s not eating tofu. 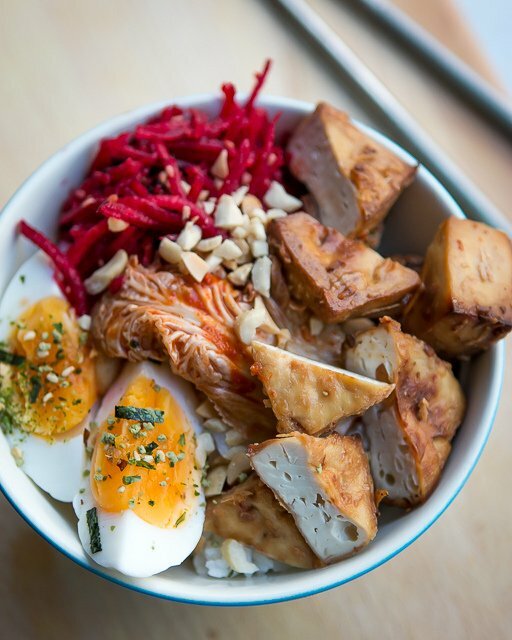 Looks delicious and now on my to try list – I adore tofu. The most delicious and most foolproof brown rice recipe ever, done in the oven. This is adapted from from Eat Fat, Lose Fat by Dr. Mary Enig and Sally Fallon. As many of you know, coconut is considered a healthy fat. Preheat oven to 300 degrees, rack in middle. Have ready an 8×8 inch pyrex or similar-sized baking dish, and tear off two pieces of aluminum foil so you can double-cover it. Melt butter in a saucepan big enough for rice and liquids. When butter is melted, add rice and stir until rice looks “tweedy” and is thoroughly covered with fat. Pour in coconut milk and broth (or other liquid) and bring to a boil. Remove from heat, stir in salt, and immediately pour into baking dish and cover with two layers of foil, well sealed. Bake for about two hours. This is a very forgiving recipe. If it stays in a bit longer, you get a nice crispy layer of rice against the pan. If you’ve got the time, let it stand out of the oven with the foil on for a bit. As you can see, this is basically a pilaf. You can add all kinds of things, including sauteeing onion at the beginning, or baking with golden raisins or a cinnamon stick. Every time I serve this, guests demand the recipe. So.. if you’re doing an event with Joe Yonan, does that mean you will be in DC on your tour? Sure hope so! I was making homemade noodle bowls last night for dinner and was so excited when I saw this. I made some for people to add to their bowls and it was a big hit. Thanks for your wonderful blog. I stumbled on this method about a month ago and was very pleased with the results. I have some marinating in a more simple mix of olive oil, soy sauce, garlic, and balsamic (no black vinegar). I will definitely be trying the marinade you describe. I cut the block into 1 inch slabs before pressing with 2 nested cast iron skillets. I tried pressing after cubing and was getting too much crumbling of the tofu. And I must tell you that when I could not resist some lackluster tomatoes a few months ago, google brought up your oven roasted tomatoes, Since all the herbs were busting out in the garden here in So Cal I tried the simple recipe and it has become a staple for me. The house is currently magnificently fragrant with the herbs and tomatoes. Thank you! a great dish to make when i get off my fluid fast next week and have to begin to eat with caution. I never have a bit of trouble with short grain (Lundborg organic) brown rice. One cup of rice, one and one half cups water in my small sized electric rice cooker. Push the starter and it does all the work. I have often stir fried tofu for a crunchy exterior with mixed results and lots of absorbed oil. I will definitely try this method. I keep a large smooth rock in a drawer as my weight but will now try a tea towel as well as the cornstarch. Thanks. DAMN! 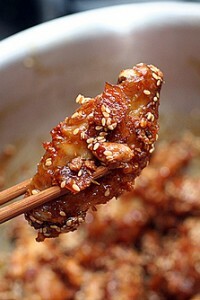 I want to try and make this because thus far I have failed miserably in making tofu. At least I think, but my friends disagree. Either way this looks Yummy! I’ve tried a few recipes with tofu before but never came to be quite enthralled by it (without being displeased either). I prepared this one for dinner tonight, maybe in too much a hurry for the marinade so it certainly wasn’t as perfect as your version, but it was interesting. I wished to share two remarks: 1) I wonder whether the starch is really necessary for baked tofu (in fact, I could still feel its texture in my mouth, not ideal, but maybe I overcoated a bit!) 2) As the cubes looked a bit dry in the oven, I drizzled them with some of the leftover marinade toward the end of cooking time. I don’t think it made the less crispy, but certainly tastier. Thanks a lot for the recipe, I’m going ahead on the tofu path. Made the crispy tofu tonight, a hit! I used a mix of AB rice flour and corn flour, 2:1, and on fan oven 190 degrees, the tofu came out absolutely scrumptious! With a dipping sauce of soy and sriracha, and some stir-fried baby bok choy with hoisin, a complete meal! And I am by no means a vegetarian. Will serve this to my veggie friends though! Thnx for sharing! Have you tried baking brown rice? I have never had trouble making it this way. It works for short or medium grain brown rice. I only tried it because I have a crush on Alton Brown… But it really works! I just pulled this out of the oven and it is so good. I also cubed, salted, marinated and baked eggplant to go with this. Thanks for the great recipe. I think I’ll serve it over noodles, using the marinade as sauce. Although I prepare oven-baked vegetables quite often, it never came to my mind to do so with tofu. I tried your recipe, and it has been amazing – also in combination with soft-boiled eggs. Thank you for this wonderful inspiration. I, too, have a constant craving for Asian food. I just love it. This recipe is now on my weekend list of must-dos. My go-to music in the kitchen is JT and Steely Dan! Thanks for the recipe! I love your blog! If you ever run across Tamaki Haiga short-grain rice, it’s a great intermediate step between white rice and brown rice. I’ve found it a useful way to introduce my brown-rice-hating guy to try something that might broaden his horizons. It’s fully milled, so it tastes a lot like short-grain Japanese sticky rice, but it has the germ still intact so there’s a tiny little hint of that nutty flavor (plus it’s healthier than plain white rice because the germ is where all the nutrients are). Also, it’s good to see another person who loves furikake as much as I do! Yum! The tofu recipe was awesome!! I’m addicted! My tofu is happily marinating on the counter- really looking forward to trying this out. Love tofu on all it’s forms, unless you have to bog it in oil to get it to be tasty. I made this tofu for my boyfriend and I, and we loved it! Flavorful and indeed crispy. I served it on brown rice with carrots and zucchini matchsticks sautéed with fresh ginger and lemongrass. 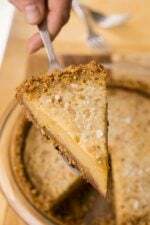 I can’t wait to try making this again, but will probably double the recipe so we actually have leftovers.